April Cornell - Live Beautiful: Tea Towel Giveaway! Take a few minutes and share a favorite stew or soup that brings comfort on a chilly day (just the kind of stew/soup is okay - or if you're feeling ambitious let us know the recipe!). 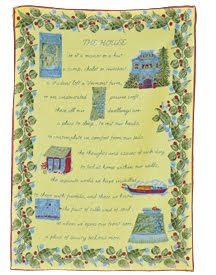 We'll choose the winner of an April Cornell Tea Towel - "The House" - from the visitors who leave a comment to this post. On Friday, we'll use a random number generator and announce the winner of a tea towel. Be sure to check back and see if you won! A delicious seasonal stew. 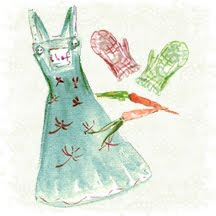 Friends it is time to put your apron and cook! My father loved stew, and my mother liked to make it for him. I too love stew, and find it such a comfort dish for the change of seasons. As the stew simmers and its savory smell fills the air, I set my table with a rich autumn colored tablecloth, tall candles, and deep plates. The candle light casts a spell of homey beauty, a table fit for conversation, good food and friendship. Here's my recipe for Dad's stew, modified. The secret - the deliciousness of this stew, is the lamb. It gives the rich meat flavor, evoking the umm, umm, yumm, spoon scraping experience. 1. In a low dish put flour, salt and pepper, then roll the cubed meat in it (if you run out of flour, add more). 2. In a large frying pan, cut your large onion and fry in butter, on low heat. 3. Add meat to pan, turning so that all parts become sealed. I add more butter if it is too dry. You don't want the meat to stick to the pan; the butter and flour on the meat are creating a nice gravy. Put aside when meat is done (you can put the meat in a large pot to wait for the veggies, as it gets ready). 4. Vegetables - I like to parboil my potatoes - I have a real aversion to hard potatoes. I cut my potatoes rather small (not in cubes - a quarter potato or less depending on the size) this is mostly my own prejudice as I don't like the potatoes to dominate the stew - I like the meat, carrots and turnip to be the main experience. I parboil the carrots and turnip as well, together in the same pot as the potatoes. The turnip should be peeled and cut into smallish pieces, a little smaller than the potato. I let them cook for about 5-7 minutes, before adding to the stew. 5. In the big pot, I add the stew meat and all the vegetables. 6. Add 1/2 to 1 cup of water, not too much - this is not a watery stew, it is thick and rich and meaty. Use the water that you boiled the vegetables in, it is more flavorful. 7. Put the lid on the pot and let the stew simmer for a few hours, stirring occasionally. Add a little water if it is too dry, or flour if it is too watery (keep some of the boiled vegetable water in a measuring cup that you can mix your flour in that before adding to the stew). 8. When the delicious smells begin to waft, slice your loaf of crusty bread, decant your red wine or pour a glass of apple cider to accompany the meal. Place chicken in a 6- to 8-quart pan. Add onion, celery, carrots, garlic, parsley, bay, thyme, coriander, pepper, allspice, and 2 quarts filtered water. Cover, and bring to boiling over high heat; reduce heat and simmer gently until chicken is no longer pink at bone in thigh (cut to test), about 1 hour total. Remove pan from heat; lift out chicken and set on a plate. Discard parsley. If making ahead, let broth cool uncovered, then cover and chill until cold or up to 1 day. Skim or lift chilled fat from broth and discard. When chicken is cool, pull meat from bones. Discard bones and any skin. Tear meat into bite-size pieces. If making ahead, cover and chill meat up to 1 day. Cover soup, and bring to a boil on high heat. Add noodles; cook until tender to bite, 6 to 8 minutes. Stir in chicken and heat through, 3 or 4 minutes. Ladle into bowls. Add salt and pepper to taste. Makes 14 cups. Serves 6 to 7. Cut all to bite-size. Put all ingredients except milk and chives, in the crock pot. Cover and cook on low for 10 to 12 hours or high for 3-4 hours. Stir in evaporated milk during the last hour. Serve with chopped chives. Serve with French Bread and salad. This variation of squash soup is named for my daughter, Justine... using her nickname given by a close friend! 1/2 tsp. each of cinnamon, cloves and nutmeg. Melt butter and fry spices and veggies until the onions are translucent and mushrooms are giving up their juices. Keeping all ingredients in the pot, deglaze the onion/mushroom mix with a 1/4 c. white wine or sake. To the pot stir in 4 cups chicken or veggie stock, the cooked squash, and 1 large can garbanzo beans (chickpeas) OR 1 can black beans (your choice), drained and rinsed first!). Simmer gently for 10 minutes. Add 3 Tbsp. chopped cilantro. Use a potato masher by hand or use a handheld blender to puree the soup on the stovetop or remove from stove and run the soup through a blender. Try to leave some of the beans intact. Ok....I love to eat soup in the winter....it feels so healthy. Lately I have been working a lot so I haven't had time to make soup. But, I love Panera Bread's soup bowl with Cream of Chicken and wild rice being my favorite. Your recipe looks wonderful and am looking forward to making it!!!!! I love everything you do, especially the tea towels!!!!!! We eat a lot of "one-pot" meals in our house -- mostly because they are delicious, but I enjoy the added benefit of having one pot to deal with! Soups are always a favourite, especially after a turkey or chicken dinner, using home-made stock. Brown the meat, onions, and bell pepper. Add garlic and seasonings. Add the rest, stir, and let simmer, tasting now and then for flavour adjusting. Put potatoes, peppers, onion & corn into kettle. Cover with water and boil until tender(water about 1/2″ - 1″ above veggies). Add cream & butter. Simmer until heated through. Stir in crab. Season to taste (we usually just add salt & pepper). Voila. This simple recipe is a favorite at Windy Ridge! Our favorite stew we cook in a slow cooker. Then we can smell and enjoy it all day as well as when we finally sit down at the table for the family meal. We've made it for friends at one of our monthly dinner get togethers as well as made a big batch last Christmas that we kept eating with different family members between Christmas and New Years. Toss beef cubes in flour salt and pepper (this is where you may have to add more flour, depending on how much meat you cook). Combine all vegetables (see note below about the frozen veggies) except the tomotoes and add to the meat. Combine the beef broth, water, and brown sugar. Pour over meat and vegetables. Add tomatoes and stir carefully. Cover and cook on low 10-14 hours or on high for 4-5.5 hours. (You need a really large slow cooker for all this. Or two round 4-5 quart size.) One hour before serving mix together flour and water and stir into slow cooker. (This will thicken the broth, so you may need to add more as necessary.) Turn to high for the last hour. Cover and cook! Enjoy! NOTE: I added the frozen vegatables (corn) during the last hour. In a large pot, add tomatoes, kidney and baked beans and onion and pepper mixture. Bring to a boil. Cover and simmer about 20 min, stirring every so often. Serve with crusty bread. This creamy, rich, comfort food starts with a broth, sweet carrots, mushrooms, scallions, wild rice and a 40 minute simmer time on the stove. Once the rice has popped you make a thick roux with butter, flour, salt, poultry seasoning and cream or milk. Add the roux back into the broth, stirring constantly. Stir in cooked and cubed chicken (or Turkey if it is after Thanksgiving.) Finally add the crumbled bacon and some sliced green olives, if you like, for a bit of salty goodness. Do not boil-- will thicken with time on the stove. Haven't met anyone yet who did not like this one...even the kids request it. my favorite is my mother's potato soup, which I don't make. I guess it doesn't count. The favorite I make is simple chili with a sweet cornbread we call "Johnny Cake." The Chili is: sauteed onions and garlic, a big bunch of slowly browned ground beef, a big Jar of V8, (might as well get all your veggies in!) two cans of chili beans, hot chili powder and salt & pepper. So simple and so wonderful. For me it's split pea soup. No real recipe. Just cook split peas till they are good and tender with leftover ham pieces or a hamhock. sometimes I'll add a package of the ham that is already chopped up. Chop up some potatoes and cook them with the peas and ham along with a little chopped carrots. Season to taste with salt, pepper, garlic. Ummmm! think I'll go make some now! Saute the onions, garlic, celery and rice in the butter until fragrant. Add lentils, chicken stock, bay leaf, tomatoes, thyme, oregano and cumin and bring to a boil. Simmer for 1/2 an hour. Puree 4 cups in a blender and return to the soup. Add lemon juice, fresh parsley and/or coriander. Garnish with yogurt or sour cream if desired. I love women who share their recipes! When you hit a slump...along comes a friend with a recipe tried & true. Place meatballs & pasta in 2 quart soup pan and cover with water. Simmer 10 minutes, add water if needed, then broths, tomatoes, & spinach. Season to taste, ladle into bowls and garnish liberally with cheese. April makes my world more beautiful! This is the right time to have stew. For Chinese culture, a tradition from generations,having stew in the beginning of winter will help you to prevent getting cold in the winter. This delicious recipe is almost a meal in itself. Good all year round, but especially on a cold fall or winter day. Serve with thick slices of multigrain bread (or white crusty bread) and some cheese. Or, sprinkle soup with shavings of Parmesan cheese. Cook onion and garlic in olive oil until transparent. Add celery stalks and carrots, and cook a few minutes more. Add the spices and pimento paste, and cook for a minute to develop flavors. Add the tomatoes, chicken stock, and water. Finally add the lentils, and salt to taste. Bring to a boil and then simmer for an hour. Add the black pepper before serving. Stir in beef broth, spaghetti sauce, kidney beans, water, carrots, zucchini & italian seasoning. Cover & simmer 10 min. Stir small amount of milk to flour to make a paste. Sprinkle reserved bacon & parmesan cheese over each serving. their food from scratch. They would often come over to our home with all the ingredients for a soup or stew and teach us grandchildren how to make it. It was a wonderful loving experience I still cherish. It warms my heart every time I eat it and think of Nono and Noni. Saute celery, onions, garlic in butter on med heat. Add broths and tomatoes. sausage until brown. Add sausage to broth and S & P to taste. Simmer 30 mins. Heat the olive oil in a large stock pot over medium-high heat. Add the garlic and ginger, habanero chili and cumin. Saute for 2 minutes. Add the onion, sweet potatoes, cauliflower, tomatoes, cooked beans, water and saffron. Simmer until the vegetables are tender, 20-30 minutes, stirring occasionally so the vegetables do not stick. Add sea salt and cilantro. Simmer 5 minutes more. Adjust seasonings if desired. I serve it over a brownrice/wild rice pilaf which I make with cinnamon and raisins. The sweetness of the rice compliments the stew. Everyone always asks for the recipe. I love all kinds of soups and stews, but somehow I am crazy about Maryland Crab Soup and Moroccan Harira Soup this fall/winter. I also cook Apple and Butternut Squash Soup for my toddler son pretty often recently. My favourite fall soup is a Harvest Squash Soup. I make the recipe from my head so it changes nearly every time I make it. I always use freshly roasted squash, white wine, applesauce, orange juice and navy beans (for protein). It's always a hit! Tammigirl, do you have a recipe for Johnny Cake? My mom used to make it and I have not been able to find the recipe.